What’s the secret to more productive design and creative projects? A smooth creative process. Designers have a host of tools to help them create designs, but what about a tool to plan and manage the work to take it from brainstorm to approved? Without effective creative project management, teams lose time and productivity going back and forth on a creative brief or spin in circles on a feedback loop. 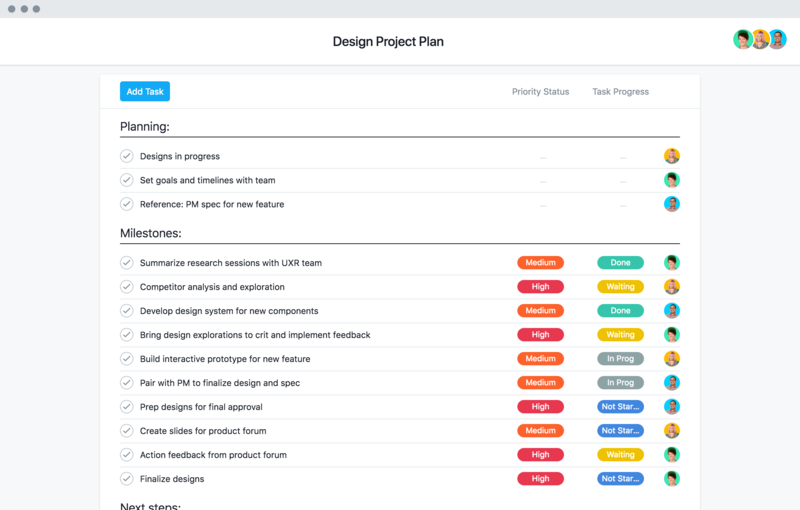 Instead, web, graphic, and product designers across agencies and companies can rely our creative project management template to start any project strong, and manage it to success with Asana. Create repeatable processes. Starting from square one with every design project plan leaves you open to wasting time and repeating mistakes. Our template gives you a clear process to get right to work every time. Collaborate in one place. Design projects involve tons of ideas, files, and feedback. Keeping it all in one place makes it easy to get to get to work and reference it when you need. Get clarity and accountability. Design processes slow down if details and approvals aren’t clear. Managing your design project with Asana shows who’s doing what by when, and gives them the work context they need—all in a task. Start your design project with our template, then master project management with these strategies. Project management is our bread and butter, and now it can be yours, too. How do you plan highly collaborative creative campaigns across a remote team? See how InVision does it with Asana. What could your design team achieve if it were 45% more efficient? Find out with a free trial of Asana Premium.